Scottish couple, Paul and Elidh, grew up together. They became childhood sweethearts, then years later they were reunited and realised what everyone around them had always known – that they were made for each other. We, at Sunshine Weddings Spain, never know how our future wedding couples are going to hear about us…so we were delighted to discover that Paul and Elidh had been recommended us by a stranger in a Spanish bar. Clearly word gets about. We quickly got busy discussing wedding styles and venues, and the couple were open to all our suggestions but especially loved our Hacienda villa with its pretty mountain views, large garden and beautiful interior. But as soon as we took them along Marbella’s Golden Mile and showed them our Marbella Beach Club they knew that they had found the perfect wedding venue. So, because they were so blown away by both places, they did what any smart couple would do – they decide to stay at the Hacienda with their closest friends and family, where they would later host an amazing post-wedding pool party, and still have their dream Marbella wedding by the Sea at the breathtaking beach club. Happy days. Paul and Elidh were a wonderful couple to work with and planning their big day was a great delight for us. On the day their guests were transported by coach from the Hacienda to the Beach Club and were led to a stunning private garden where the wedding was being held. Friends and family were seated beneath the trees, shaded from the Spanish sun, listening to the hypnotic melodies of the Spanish guitar played by one of our talented musicians. The service was beautiful, the bride resplendent wearing a fitted strapless gown with her hair tumbling down her shoulders, styled by our talented beautician Lorraine. 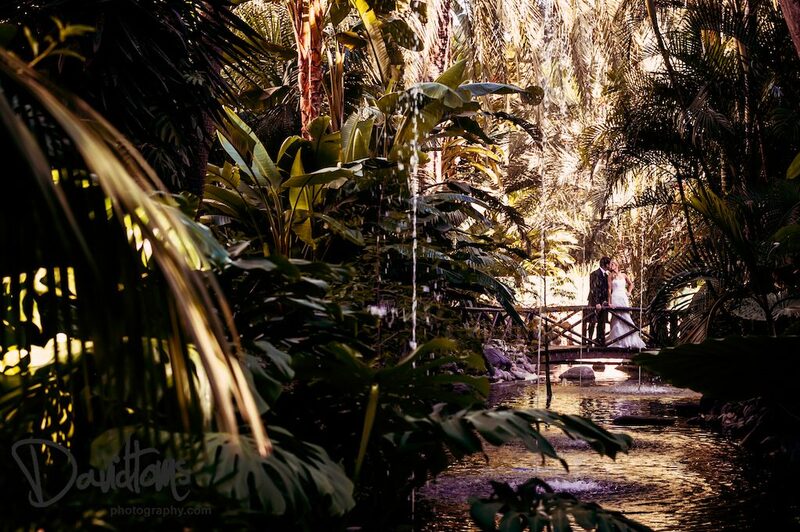 David, one of our very popular photographers, captured some beautiful moments between the couple in the tropical gardens. The beach club grounds, designed over fifty years ago, are a lush paradise full of water features and a pretty bridge. A favourite place for our couples to pose for their wedding portraits. Find out in Part Two where the Scottish piper led the guests for the Champagne drinks reception and why mixing live music with a DJ is the best way to party at your Marbella wedding by the sea.